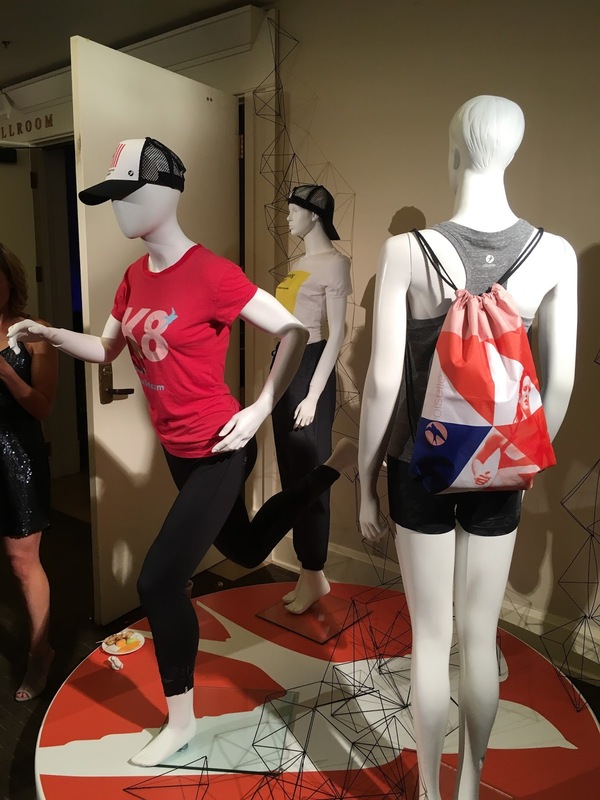 Olympic Trials 2016 - What a Week! 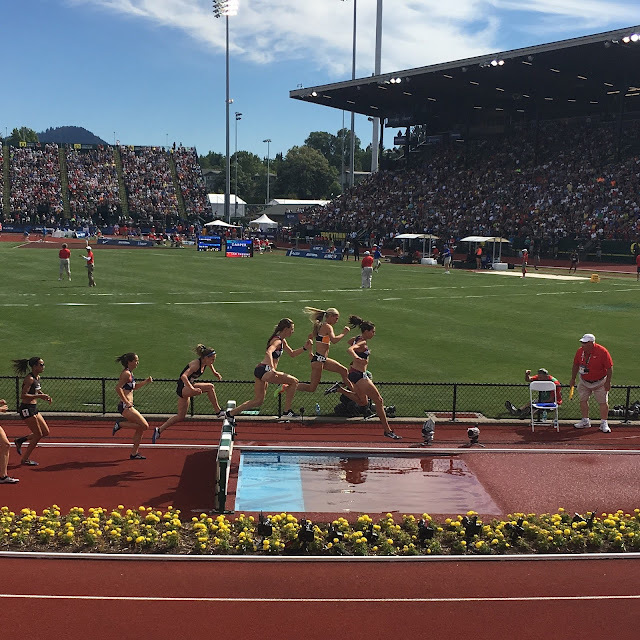 The Olympic Track and Field Trials happened during the first week of July, and I was lucky enough to make the trip to Eugene, OR, to spectate and cheer for the athletes. It was fantastic! 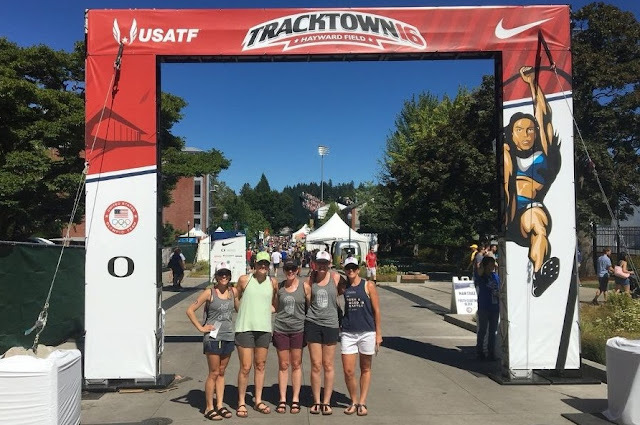 The energy in Eugene was high, and we constantly ran into Olympic-hopefuls (some now Olympians) while running in the area. I headed to Eugene on the evening of July 2, so I missed the first couple of racing days including events I wanted to watch, the Women's 10K and 800m prelims. 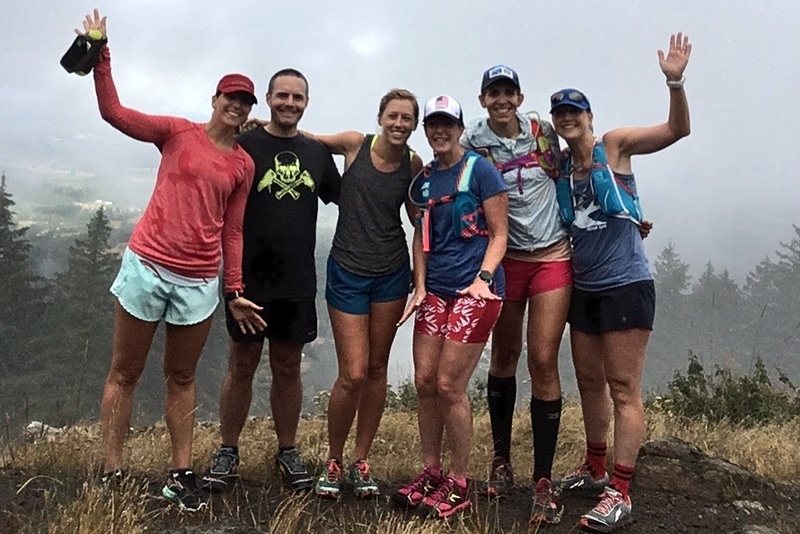 That decision was due to wanting my 22 mile long run to be on home trails before flying out, and that really did make my life easier with regards to my 50K training plan. Marilyn picked me up from the airport when I landed, and we headed back to our house to meet up with the rest of the crew. 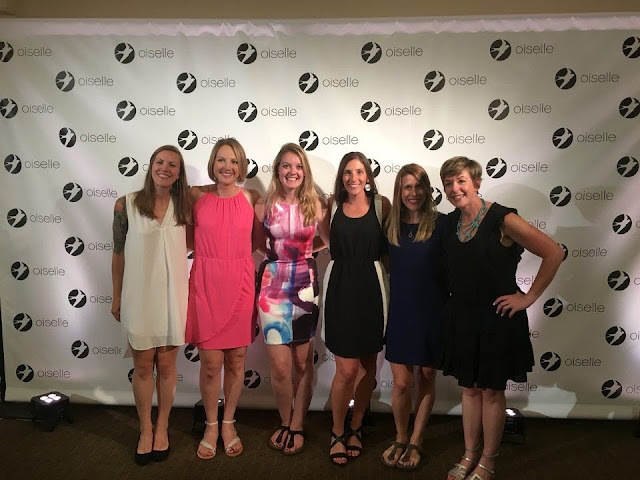 I stayed with an awesome group of ladies I met via Oiselle: Marilyn, Tara, Kaleigh, Krysta, and Lynn. Marilyn's husband, Travis, joined us for a few days too. This is a tough one to recap - at least in one post - but I'll do the best I can with highlights. There were many activities during the week even beyond the track; we went to Oiselle morning runs, Brooks morning runs, a day at the park, parties, beer adventures...and so on. 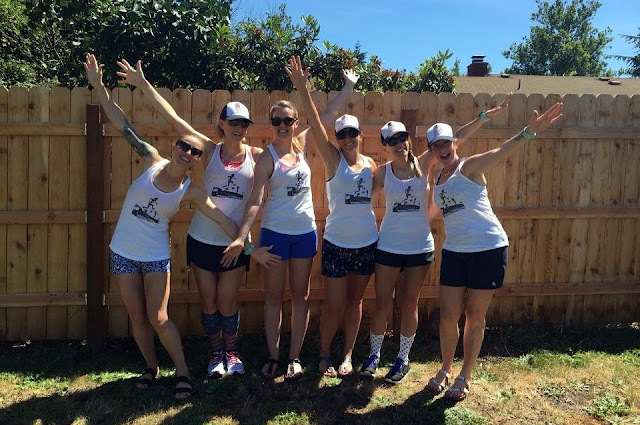 My first full day in Eugene, we joined the Oiselle group run followed by an in-person Jasyoga session. I usually use the Jasyoga videos, so this was a nice treat! Erin's voice is the best for relaxation and their 'yoga for runners' style works well for me. 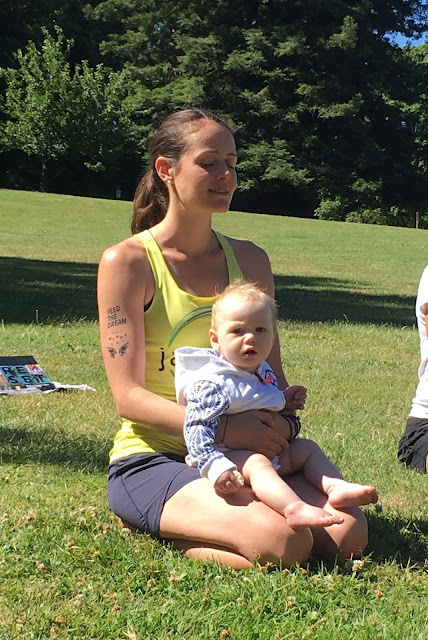 Erin ending the session with her little one, Rose. We followed the run with a trip to Hop Valley for beer and lunch, then lots of track spectating in the evening. The following day would be the Butte to Butte 10K, so everyone turned in fairly early. 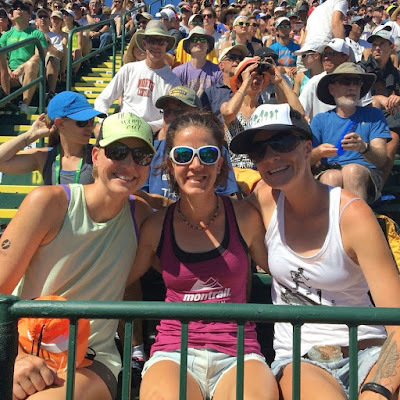 I decided not to run Butte to Butte after my big training week and long run, so I slept in a little and then went to the finish to cheer. Part of me wishes I'd run it to see the course, but all in all it was the right decision for the day. 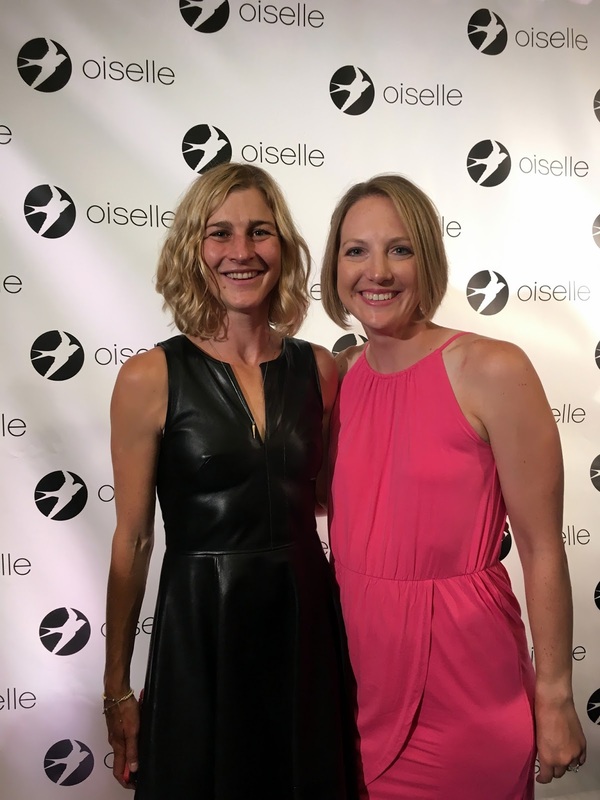 That afternoon, we went back to the track for some big events from the Oiselle team angle: the steeple prelims and the 800m final. Talk about an exciting day at the track! 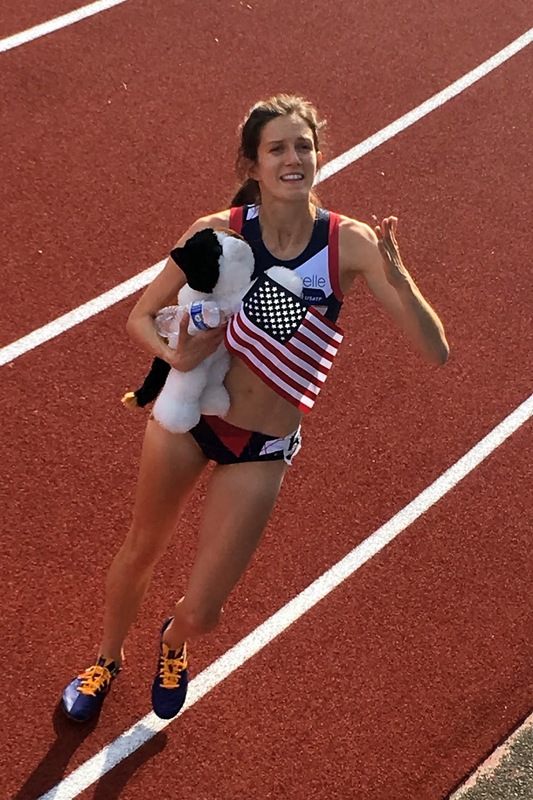 Three ladies moved on to the steeple final and as you likely already know - Kate Grace won the 800m and made the Olympic team! 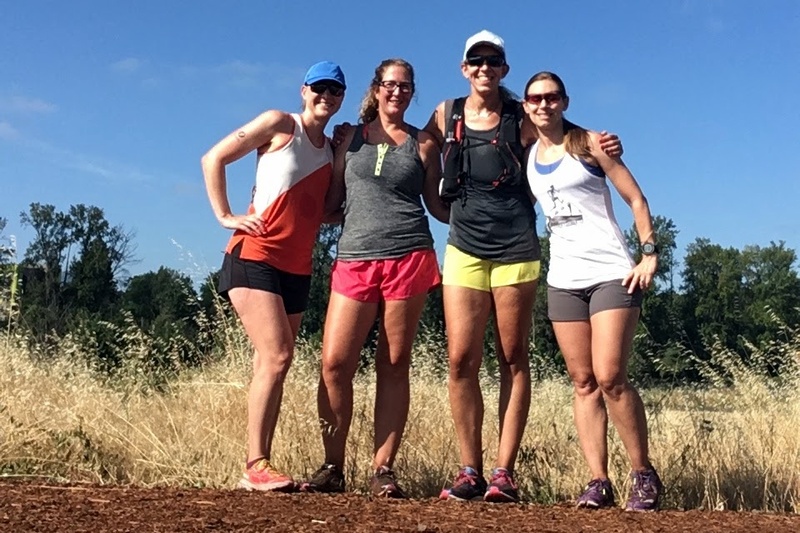 The next morning was another Oiselle run, and I really enjoyed running with Tina, Rachel, and Ali that day. Great pace, great company! After the run we hung out at a park for most of the day because it was an off day for the meet, enjoying some hula hooping, Jasyoga, and sand volleyball with the Volée group. Me, Rachel, Ali, and Tina. 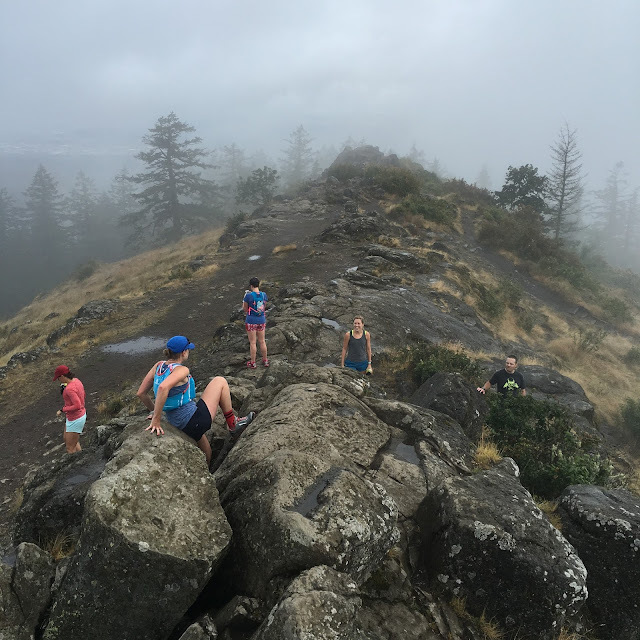 By this point I was chomping at the bit for some trail time, and I was thrilled that BayBird friend Rebecca was up for a Spencer's Butte summit day. We had beautiful weather for views and loved running on the Ridgeline trail system, plus my body was happy to do some climbing after so much flat running (stretching out the calves!) The trail system was awesome and the part we were on that day was easy to follow. View from the top of Spencer's Butte. Rebecca and I at the summit. 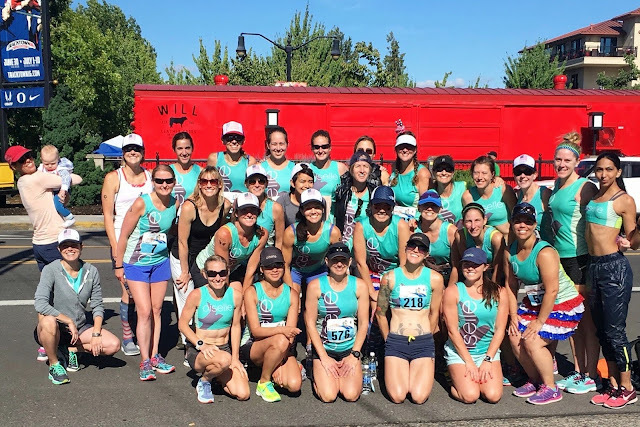 On Thursday morning, my house joined the Brooks group run, complete with the opportunity to get an autograph from Nick Symmonds. We didn't wait in line for the autograph, but I did score some fun Brooks swag as souvenirs for my hubby and a friend! They were giving out awesome trucker hats and t-shirts. Thursday afternoon brought more excitement at the track, including the men's 5K prelims and steeple final. Unfortunately, it also brought a turn in the weather to cold rain that I most definitely wasn't prepared for. 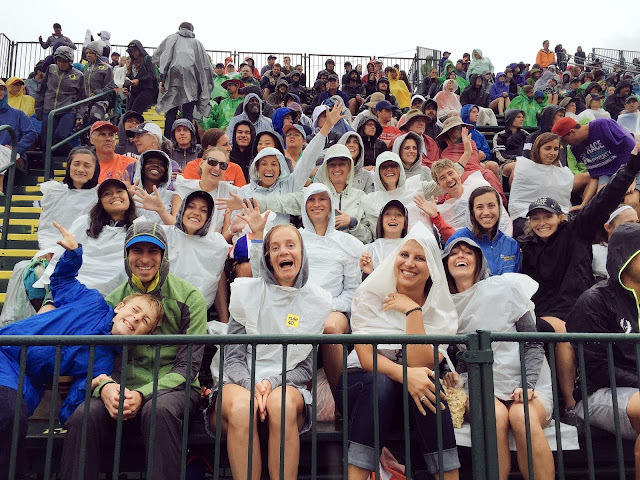 Oiselle HQ saved the day by running back to their house for trash bag raincoats and we all huddled together in the stands for warmth. 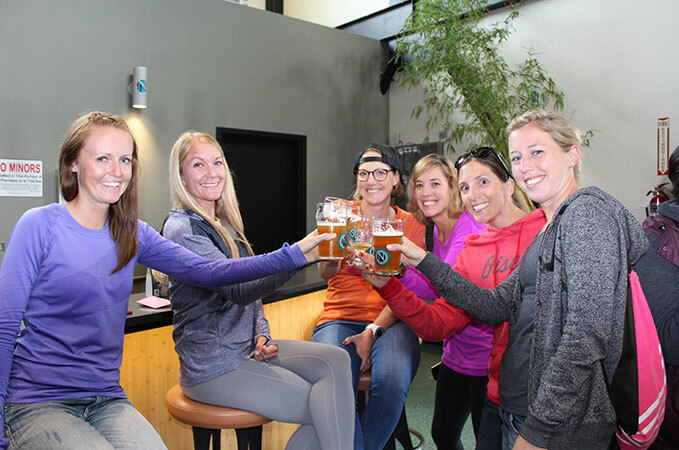 Thursday evening we hit up the Picky Bars party - thanks to Lauren, Jesse, and the team for a fun time! They had live music, drinks, food, and of course, Picky Bars galore. It was the perfect atmosphere to hang out and chat with everyone. On to Friday! This time we were smart and bought ponchos for the meet, and boy did they come in handy. I skipped the morning run and enjoyed my rest day, hanging out at the house with coffee and the internet for company. At the track, we cheered for more speedy races like the men's steeple final, then went to Ninkasi for a happy hour. I love Ninkasi and really enjoyed the 'Beer Run' IPA they made for the occasion. As I continue to recap, I realize just how long I was in Eugene; it's crazy how fast time went while I was there. My last full day in Eugene was Saturday, which brought long run day, the Oiselle party, and Tara's birthday! We kicked off the day with a long trail run, which I somehow talked 5 other people into doing with me. It was wonderful! 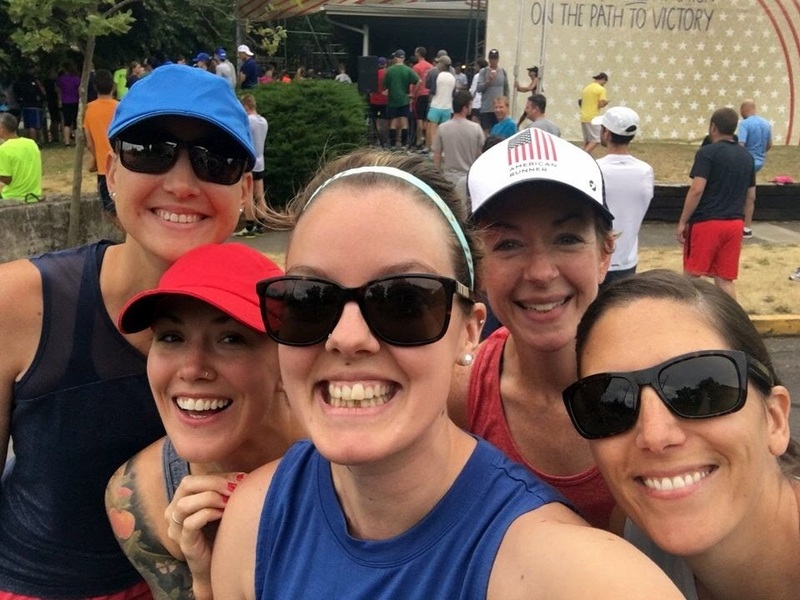 A few of us did 16 miles, and others did 12 miles by starting farther along the trail. 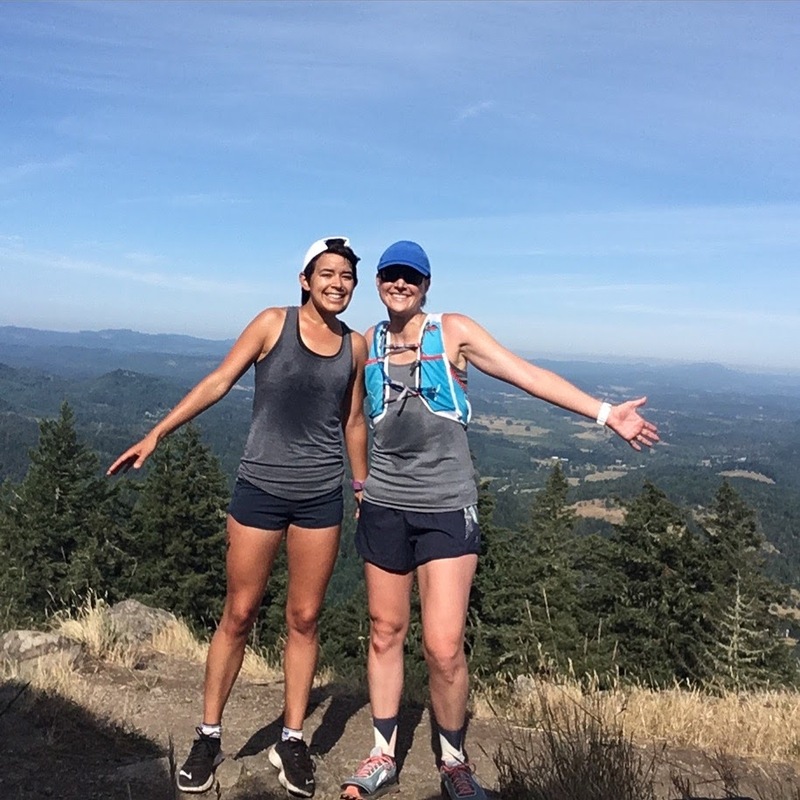 We ran the Ridgeline trail, which has nice rolling single track for miles. 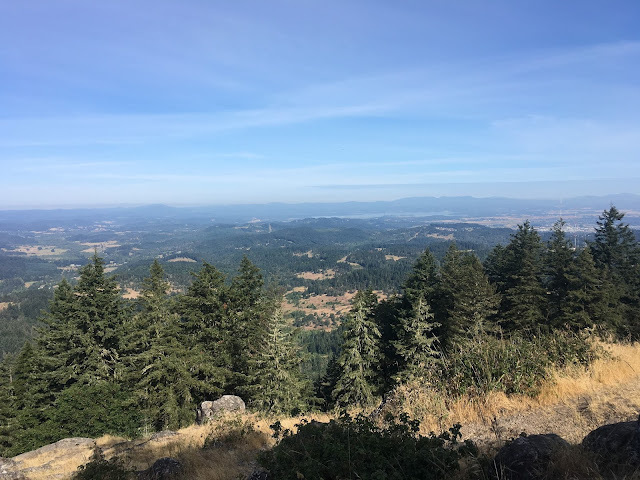 From there, we turned onto the trail to the Spencer's Butte summit and climbed to the top. It was rainy and cloudy so we missed the views, but it was still spectacular to be up there. Summit - Marilyn, Gavan, Jess, Tara, Ali, and me. I don't have many photos from the rest of the run because it started raining more. 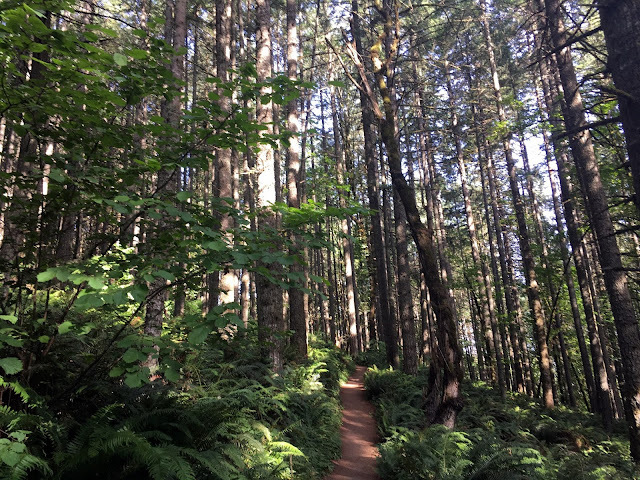 We continued along the Ridgeline trail and over Mt Baldy, got a little lost and found our way to the Amazon trail, then caught the Ridgeline trail back to the car. I'm still not sure where we missed the turn coming down Mt Baldy, but hey, what's a trail run without some adventure? That evening, we went out to dinner for Tara's birthday at Oregon Electric Station and then to the Oiselle party. The party was awesome - fashion, a talent show, drinks, dessert, dancing - we had it all. Fashion show with a red, white and blue theme. Photo with Lauren! I love her dress. The whole week was wonderful, especially because I was able to spend time with many people; some I knew before, some I knew online only, and some I didn't know at all before the trip. I'm thrilled to have this experience and to keep getting to know them going forward. 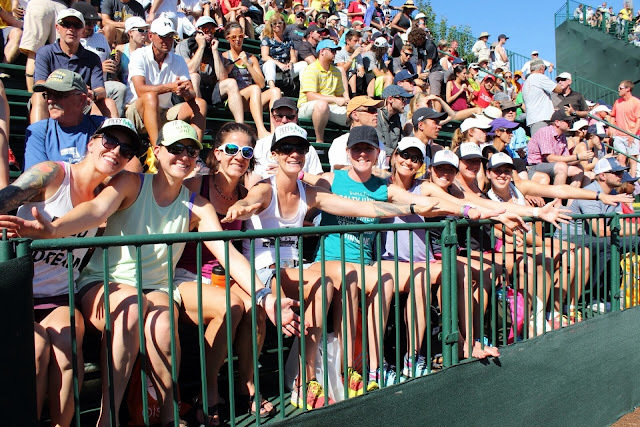 A HUGE thank you to Oiselle for planning and encouraging us to join in the trials festivities! AHHHH!!! I love this so much! I'm so glad that you posted this so that I can come back and look at it when I need a little pick-me-up. I can't tell you how much I enjoyed sharing this experience with you and the other gals at the house; I certainly hope we can meet up again sometime! Just think...you almost didn't make it. :) Teammate enabling for the win!! Thank you for letting us live vicariously through your social media posts and this blog! Fun times were definitively had! Yes - super fun! Can't wait to see you in WV! What a fun weekend! I was up there for the Eugene Marathon & May & my one regret is that what with tapering/running a marathon, hiking/trail running some of the amazing scenery wasn't an option. Another trip, maybe! Yes - another trip with scenery would be totally worth it. :) I love visiting Eugene! It was so fun, thanks for reading!